You’ll want to see it again. Prepare yourself for an extraordinary cinematic journey in this science-fiction thriller complete with commentary on the human condition. From the exhilarating cinematography to the incredible awe-inspiring visual effects, Arrival will have you hooked from the very beginning. Based on the book Story of Your Life and Directed by Denis Villeneuve (Sicario & Prisoners), Arrival boasts an outstanding cinematic experience that is as much cerebral as it is visceral. Your very perceptions of time and memory will be questioned and force you to open your mind to endless possibilities. Poignantly, this film takes you on a journey that will show you that we need to change and that we can change. On the verge of avant-garde, Arrival pushes the limits of traditional visual storytelling and creates an innovative method for conveying social commentary within the science-fiction genre. Following the final fade to black, you’ll want to discuss this film with your friends. Reignite your sense of wonder. Arrival is more than a story; it’s an experience! 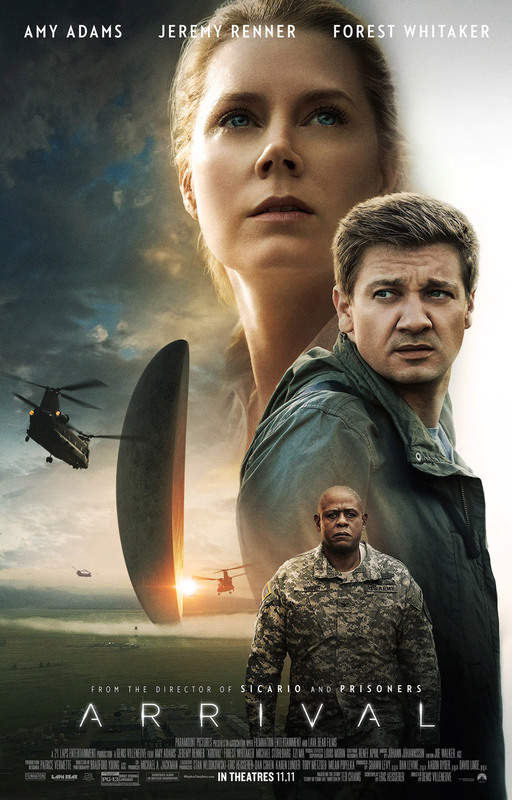 After twelve egg-like unidentified objects land on earth, the U.S. Government calls upon expert linguist Dr. Louise Banks (Amy Adams) and theoretical physicist Ian Donnelly (Jeremy Renner) to crack the mystery and develop a means of communication with the homogenous alien species. While much of the world is on the brink of an all-out assault on the aliens, Banks is determined to establish a rapport and open communications with the species. Starting with basic words and working up to complex sentences, Banks knows she has to learn the aliens’ language in order to better understand why they have come. When things take a turn for the worst, Banks and Donnelly have precious little time to stop countries from engaging in battle with risk of war. With so little time to unravel the mystery of why the aliens are here and what they want, Banks will find herself on a mind-blowing journey of her own. You’ve just got to see it. There is so much that I want to talk about, but it would spoil so much of the film. I’ve mentioned before that there are great ‘movies’ that are mediocre ‘films,’ but this is a prime example of an excellent movie AND brilliant film. The brilliance of this film is not in the stunning visuals, although that is certainly part of it; the brilliance lies within the cinematic and experiential storytelling. During the big reveal at the end of the film, your mind will be blown. You’ll find yourself wanting to watch it again to more clearly understand the strategic placement of the pieces of the puzzle. During a time in which the country appears so incredibly fractured, this film will provide audiences with a renewed sense of wonder and appreciation for that which one may not fully understand. Making the tough calls and putting one’s life at risk of what is right is also woven throughout this story. The theme of Arrival is not fully realized until the latter half of the film. More than a surface-level story about that which I cannot mention without giving it away, this film possesses a dynamic range of themes just beckoning for interpretation. As this film bares much similarity to avant-garde cinema in the reimagining of traditional storytelling, it will evoke a powerful emotional response. Amy Adams and Jeremy Renner deliver outstanding performances in the lead roles. Taking center stage for most of the film, Adams breaks new ground as an actor in this role that is nearly a complete departure from most of her other roles. Both Adams and Renner display excellent chemistry in their respective characters. Although Adams is the central character and responsible for the drive of the plot, Renner is strategically placed to reinforce the affects Adams’ character has upon the plot. Forest Whitaker also plays a strong colonel and was an excellent choice for his role as well. The success of the cast can be attributed to both the outstanding direction from Villeneuve and the incredible screenplay by Eric Heisserer. Bradford Young’s cinematography is so simple but yet so beautiful and profound. It is of no surprise that this film is being touted as one of the best movies of the year and has a nearly unprecedented 100% on Rotten Tomatoes. Whether you are a linguist yourself or just enjoy an exhilarating cinematic journey, Arrival is definitely the film to catch this weekend. For the Star Trek TNG or Voyager fans out there, you will find that Arrival possesses some of the same great content that sets Star Trek apart from other science-fiction shows due to the human condition being central to the overall plot. If you enjoy movies that prompt you to revisit how you perceive your life, time, or space, then you will not be disappointed. There are so many levels to this film. You’ll likely find yourself wanting to see it again after fully realizing the innovative plot. Hopefully this film receives some Oscar noms in the upcoming award season.